Before the Admiralty Pier was built, Dover’s harbour was on the west side of the bay and relatively small. Further, there was a constant problem with silting that, at times, made it difficult to enter and exit. Sailing ships would therefore anchor off shore and goods and passengers would be ferried between the beach and the ships in small boats. Prior to 1778 these boatmen, or watermen as they are sometimes referred to, would set a price and start to row. However, some would stop midway and threaten to throw the passenger and/or their baggage into the sea unless they paid more! 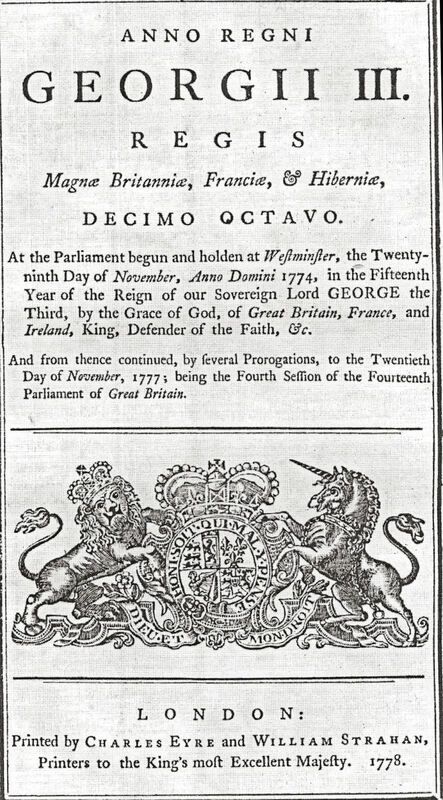 Indeed, it was stated in the Charter given by Queen Mary (1553-1558), to the town, that boatmen were required to obtain a licence and to conduct themselves fairly. The Charter placed the policing of the boatmen’s behaviour in the hands of the Mayor and Jurats but they do not appear to have taken this seriously. When the Dover Local Government Act created the Dover Paving Commission, in 1778, the duty of regulating boatmen became their responsibility. At that time, larger ships were being built which led to fewer Dover ship-owners and they hired their own fleet of boatmen. The price of the boatmen’s service was included in the overall price of the passage ticket but some boatmen were still not adverse to use threats to get a second fare out of the passengers. This eventually came to the attention of the Commissioners of Salvage who, on 25 May 1816, set a scale of charges that had to be adhered. These were 4shillings (20p) for each adult and 2shillings (10p) for each child carried with the Paving Commission and the ferry operators being obliged to ensure that this was upheld. The actual job of the boatmen was arduous; they were expected to row out into the bay in all weathers with perhaps only one helper. More helpers would mean less room for passengers and their baggage that, at times, included horses and carriages! Further, boatmen and their dependants who due to old age or sickness could no longer work, were destined to the workhouse unless another source of income could be found. In the 1820s, the local fraternity of boatmen decided to raise money for their poorer colleagues by organising a series of boat races and invited soldiers from the garrison along with the town’s folk to take part. Prize money was raised by public subscription and the event was to take place in the summer of 1826 but bad weather precluded it. Nonetheless, the publicity brought many people to the town and the following year the town organised the event. This was patronised by His Royal Highness, the Lord High Admiral William, Duke of Clarence (later William IV 1830-1837) and society folk from far and wide attended. Held on 28 August 1827, it was reported in the Times (30.08.1827) that of the three races for boatmen, only the second race was won by a Dover boat – Fly. 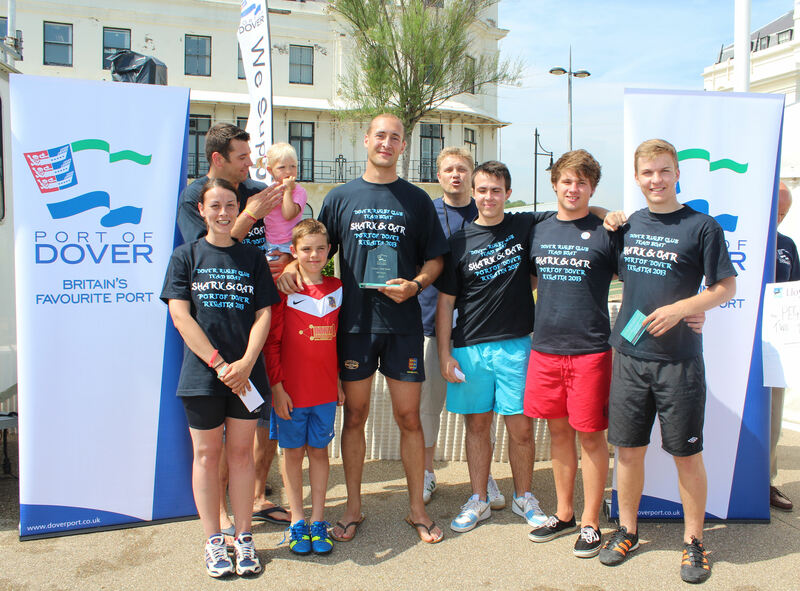 Nonetheless, the whole event was so successful that it raised the much-needed funds for the destitute boatmen and spawned the annual Dover Regatta! In 1833 the House of Commons conducted an inquiry into the distress of Dover boatmen that had been displaced by the pilot cutters and made provisions for them. By 1844 the rules governing boatmen had become stringent and safety conscious. Boats were required to be 22 feet long and 5feet 6inches wide. They were not allowed to carry more than six full-grown persons at any one time and there was to be no more than one boat on each side of any vessel at any one time. If the captain of the vessel told them to leave, they had to follow the order and any other commands that the captain might make. For landing, in a like manner, any four wheeled carriage £1 1shilling (£1.5pence). Steam driven vessels had been introduced in the 1820s and generally cross Channel ships were getting larger and carrying more passengers and goods. In March 1844, the Dover Landing Jetty Company was floated and once built it was believed that there would be no more need for boatmen as ships could tie up alongside. The jetty was to be opposite Waterloo Crescent and it was estimated that £10,000 of capital was needed. The Committee included local businessmen, Thomas Bass, Steriker Finnis, John Hayward, George Jarvis, Edward Knocker, John Knocker, Samuel Latham, Luke Smithett, Lewis Stride and Joseph Walker. The South Eastern Railway Company offered to buy £3,000 of the shares and the remaining ones sold quickly. The first pile of the Jetty was driven in 1847 and although the Dover Landing Bill was not introduced into Parliament until 4 February 1848, it received Royal Assent on 9 June that year. In the meantime, many of those who had subscribed towards the Landing Jetty were also putting pressure on Parliament for Dover to become a Harbour of Refuge. 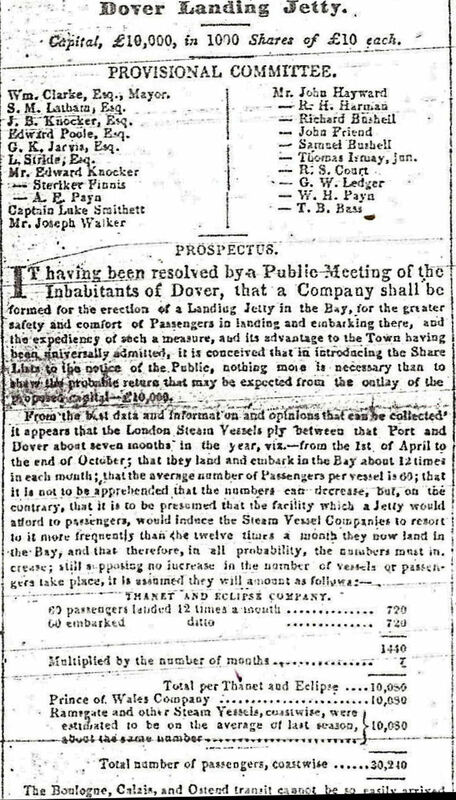 Henshaw Latham (1752-1846) – the head of one of Dover’s two banks and three times Mayor (1814, 1821 and 1830) – had put this proposal before Parliament in 1836. This had been taken up by one of Dover’s two MPs, Edward Royd Rice (M.P. 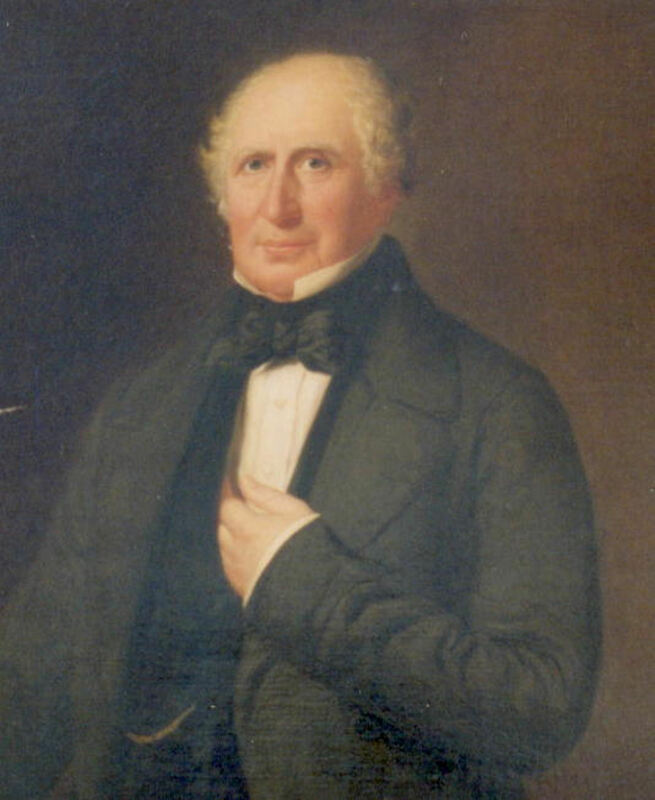 1837-1857), who was also a partner in Latham’s bank. The Admiralty eventually agreed to build two piers out into the bay that would provide the shelter needed for ships in distress. Work started in April 1848 on the west, Admiralty Pier, from what was then Cheeseman’s Head seaward of the South Pier head. This required the demolition of the Cinque Ports Pilots’ Station, which was replaced by another near the newly constructed Lord Warden Hotel. Due to financial pressures, the second pier was not built, instead a landing stage was constructed. 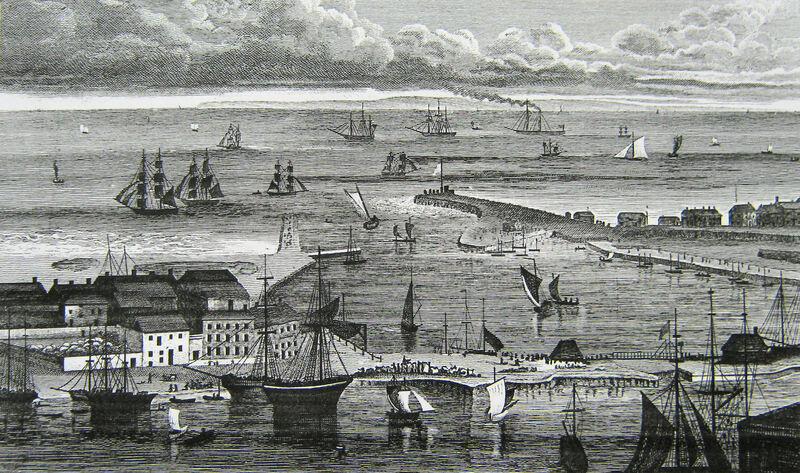 The Admiralty Pier, when completed in 1871 was 2,100-feet long and cost £693,077. It was first used as a ferry berth on 14 June 1851 when the Father Thames, landed 50 passengers and five days later the Princess Alice the first cross-Channel steamer landed 86 passengers. The use of the Pier for this purpose was sealed but this spelt the death knell of the Dover Landing Jetty Proposal. It also seriously affected the future Dover’s boatmen and some turned to their old trick of threatening passengers for more money. In February 1853, a gentleman who had returned from France for which he had bought a ticket that included the services of a boatman. On the day he travelled, they were midway between the ship and the shore when the boatman demanded a further payment of 2shillings (10p) from each of the passengers. The gentleman refused to pay and the boatman stopped rowing. It was cold, started to rain and the sea was choppy. Due to the pressure of the other passengers the gentlemen made the payment and they were all eventually rowed to the beach. However … with typical Dovorian sense of humour, we make the most of it as can be seen in the photograph above taken at the Dover Regatta of 2013! 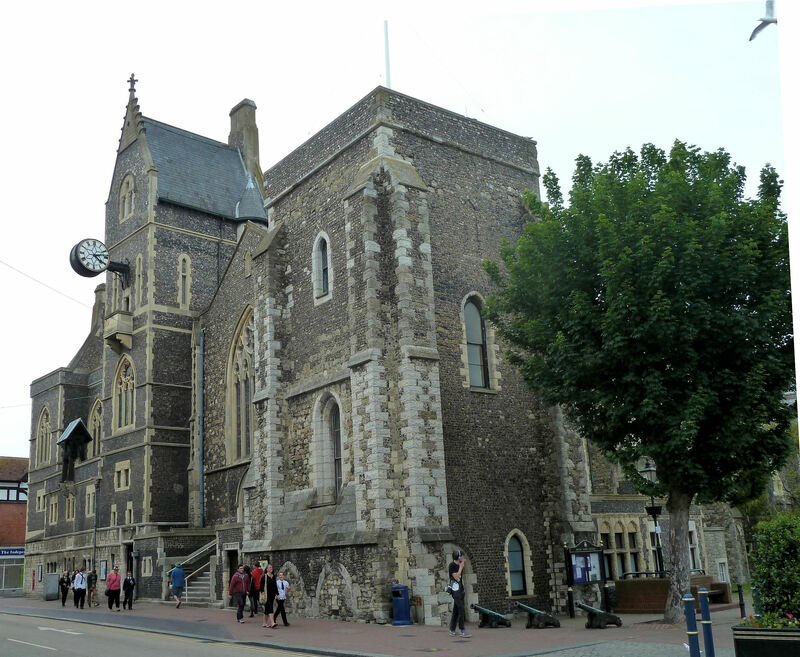 This entry was posted in Dover Sharks, Port and Transport. Bookmark the permalink.